Now that the weather is turning warmer, it’s a good time to review the problem of dehydration in older adults. * receive assistance if they have mobility problems that make fluid intake a challenge. Briefly, older adults have more physical, mental and mobility problems with keeping hydrated. This can cause a series of negative outcomes ranging from mild (dry mouth) to serious (renal failure). Now let’s slow down and look at dehydration piece by piece. Older adults can suffer dehydration for one or more of the following causes: physical changes, diet & medication changes, psychological changes. Physical Changes. Older adults have decreased perception of their own thirst. They will require fluids well before they feel thirsty. Also, the aging kidney does not manage fluids as efficiently, and the body’s ability to store water decreases. Also, the aging body can make it difficult to walk to the kitchen, get a glass, go to the sink, pour the water, and drink from that glass. Mobility problems or decreased energy levels can make this task seem “too much trouble.” Also, if the older adult is in a hot or humid environment, they will require more fluids for cooling the body. Also, some illnesses or traumas create a risk of dehydration such as high fever, vomiting or bleeding. Diet and Medications. Many older adults take medications that have a diuretic effect. For example, many high blood pressure medications promote frequent urination. Also, taking laxatives will deplete the body’s fluid levels. Also, caffeinated beverages such as coffee, tea and some sodas will decrease the body’s fluid levels. Convenience foods are often the culprit since they are often low in water content. If an older adult is eating more crackers, cookies, cereals, cheese and bread than they are eating soups, fruits and vegetables, then they risk dehydration. Psychological Changes. Depression and dementia often discourage a person from staying adequately hydrated. Also, some older adults fear incontinence, so they will cut back too much on fluids in an attempt to decrease accidents. Those at high risk of dehydration are people over 85, African Americans, those living in skilled nursing centers, people with dementia, those taking multiple medications, and those who have been dehydrated previously. Some easily observed symptoms of dehydration include the following: chapped lips, dry tongue, dry mouth, dry nasal passages (sometimes with bloody noses), dark urine, infrequent urination, vertigo, irritability, nausea, sunken eyes, and headache. Symptoms worsen as people move from a 2% loss to a 4% loss to a dangerous 10% loss of fluids. If a person is very weak, disoriented and falling, he or she may need hospitalization so that they can receive fluids on an IV, get checked for renal failure and have their levels of sodium and electrolyte measured and corrected. To prevent dehydration, help the older adults in your life to determine the correct level of fluid intake. The eight glasses of 8 oz of fluid is too low for most people, especially if the person is taking diuretics or drinking caffeinated beverages, is a taller / heavier person, is living an active lifestyle, or is living in an environment that is hot and humid. Men might need at minimum 13 glasses of 8 oz fluid. Make sure that they have access to beverages throughout the day, preferably caffeine free. Help them to include to more “wet” foods in their diet, such as soups, gelatin, and produce. 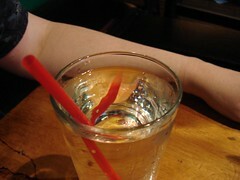 If you suspect dehydration is a problem for you or a loved one, please see a medical professional as soon as possible. Are you Dehydrated?? Ask your PEE!